Annotation: In his long-running saga of the Manticoran Space Navy and its battles (War of Honor, etc. ), Weber has chronicled the career of Honor Harrington, a distaff Horatio Hornblower transplanted into a futuristic conflict based loosely on the Napoleonic wars. 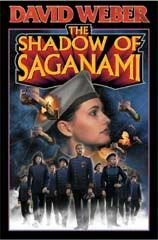 These hugely entertaining and clever adventures are the very epitome of space opera, but their emphasis on one officer's contribution tends to give a lopsided view of how a military organization fights. In his rousing second Honorverse novel (after 2003's Crown of Slaves, coauthored with Eric Flint), Weber focuses on how each member of a unit contributes to the mission's success through teamwork, discipline and individual initiative. A scratch task force is dispatched to a series of fringe systems that have petitioned to join the Manticoran Space Nation. What is supposed to be a relatively easy assignment to a sector far from the front lines of the renewed Havenite War is soon complicated both by terrorists who oppose the annexation and by corrupt elements of the Solarian League-the major power in Weber's universe-who don't want the stiff-necked Manties sniffing around their highly illegal (and lucrative) genetic slave trade. Weber emphasizes the role that tradition plays in inspiring our lads and lasses in uniform, reminding the reader that a hero can be anyone who does his or her job with honor, commitment and skill. (Nov.) Forecast: A 75,000-copy first printing should ensure a run up genre bestseller charts.